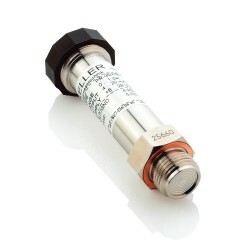 Pressure sensor for applications in bio-reactors or autoclaves. The transmitter is compensated up to 150 °C and may be operated continuously or sterilised at this level, including the conditioning electronics up to 120°C. I am measuring the pressure of a gas up to 10 bar where the temperature of the gas is at 120 degrees centigrade and I have found that transmitters errors are not normally compensated for that temperature. Could you offer a transmitter which is calibrated at 120 degrees centigrade? We would suggest the 35X HTT which is calibrated up to 120°C so you know what errors to expect up to that temperature. The total error band from 20 to 120°C is 0.2%FS for 4-20mA output, and 0.15%FS for the RS485 output. Is there a 2 bar absolute option for the 35X HTT High Temperature Digital Pressure Sensor, and is the 0.15%FS option the most accurate that can be offered? 1 or 3 bar are the standard max. pressure ranges, the analog output can be scaled to 0 to 2 bar, but accuracy is still based on 3 bar range, so the best accuracy possible would be 4.5 mbar for the digital output and 6 mbar for both the 4-20mA & 0-10Vdc analogue output. For the sensor version with electrical connection of 3 metres of shielded cable sealed to IP65, we will connect to our DAQ using the 4-20mA signal. 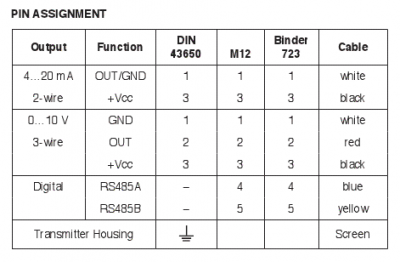 If we want to use the RS485 digital output, is it still the same two wire connection, or do we need a different electrical connection? Please see the table below which shows the wiring connections for the shielded cable, the analogue & digital signal connections are on different wires. In the case that we need to extend the cable, is there any detrimental effect on accuracy when using the digital interface? There will be no detrimental effect on accuracy of the digital reading if you extend the cable. Please select the options you require for the 35X HTT High Temperature Compensated Pressure Sensor in your application and request a quote. Send us your enquiry for 35X HTT High Temperature Compensated Pressure Sensor to get assistance with this product type.